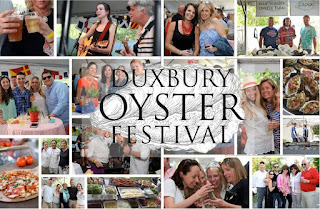 The Third Annual Duxbury Oyster Festival is taking place on May 15, 2016 at 3:00 PM at the Winsor House Inn in Snug Harbor. This year the festival will showcase local Duxbury Oyster Farmers and will benefit students through the Duxbury Education Foundation and the Duxbury Student Union. Oyster farmers include Island Creek Oysters, Snug Harbor Oysters, and Sweet Sound Oysters among others. This year, festival goers can look forward to all-you-can-eat oysters, casual fare like grilled pizza and sliders and lots of beer, wine, and festival cocktails. This year’s Duxbury Oyster Festival will also include live music from The Waves and DSU’s own Coffee House Musicians. Tickets are $100.00 and attendance is limited to ensure the entire festival offers a premier experience with no lines and plenty of food. As New England continues to develop its foodie-centric culture, The Winsor House Inn is proud to present a spring festival showcasing Duxbury’s globally known oyster industry. The Duxbury Oyster Festival is the first event of the Winsor House Inn’s busy summer schedule. By kicking off the season with this high energy event, the Winsor House Inn continues to be recognized as an important part of the Duxbury community—just as it has always been under its historic list of prior owners. The Winsor House Inn is a historic inn and restaurant nestled in a seaside village known as Snug Harbor. Rich with history stretching from its owners to its visitors, the inn is a long-time favorite of locals who love our charm and great cuisine. The family owners have a “passion for excellence” and have used that enthusiasm to restore the inn to its rightful place as one of the community’s destinations The inn and restaurant have a welcoming English pub-style atmosphere with a cozy fireplace and special brand of New England hospitality. Under the culinary leadership of Chef Franco Carubia, the restaurant menu offers a wide range from casual fare to fine dining featuring fresh seafood, New England classics, and Duxbury’s own oysters. We look forward to attending this festival! See you there. For tickets to the Duxbury Oyster Festival, click here.